To better address environmental and social challenges in today’s dynamic world, practitioners and managers need to be able to work with their teams, projects, and communities to not only adapt to change, but also to shape and create change collectively. In many places, people running the world’s most critical conservation and sustainable development projects rely on their own skills and resources. Can you imagine an elite athlete without a coach? Until recently there were no nature conservation coaches. The Conservation Coaches Network brings together a growing pool of trained professionals to support the people that run conservation and sustainable development projects around the world so they can adapt and evolve along with the heritage they care for. Through a structured learning process, our Network nurtures coaches to work with projects in ways that foster the inclusiveness, openness, and reflexivity necessary to manage change processes and guide justifiable, appropriate, and effective action that benefits people and nature. By using a common approach for adaptive management, the Open Standards for the Practice of Conservation, communities, conservation NGOs, and government agencies can engage with others to solve problems in their own language and cultural context and exchange successes and failures. Every time one of our coaches taps into our rich collective knowledge and expertise, that project gets better and faster results, improving conditions in communities and entire regions. 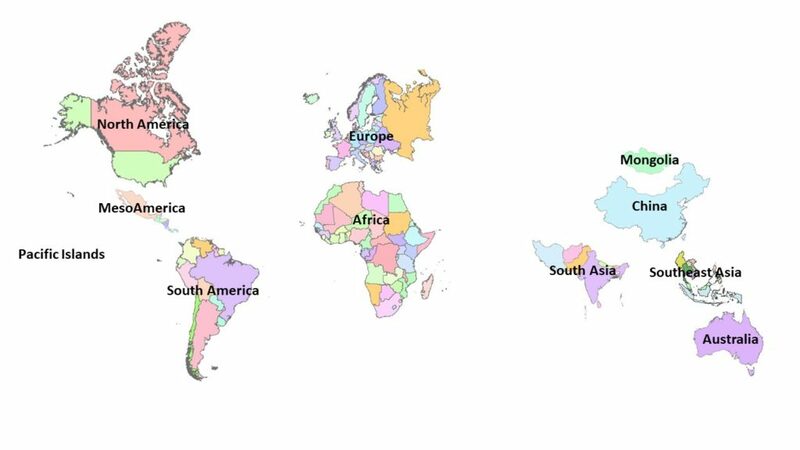 Currently CCNet is represented in formal franchises lead by local partners in Africa, Australia, Europe, Mesoamerica, North America, Pacific Islands, South America, South Asia, Southeast Asia, China, Mongolia, and a non-placed-based network on Teaching Adaptive Management (TAM) in universities. Franchises are the operational arms of CCNet who link and strengthen practitioners within each region. 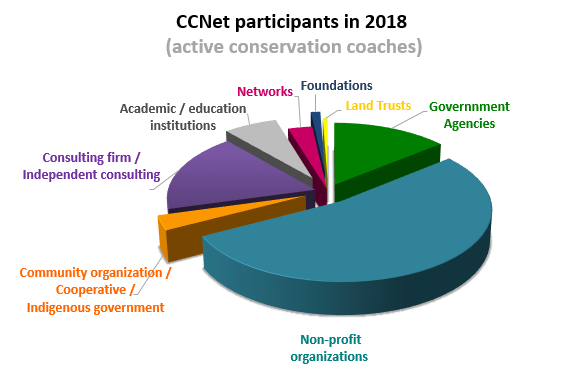 Franchise leaders, together with partner representatives from The Nature Conservancy, Greening Australia, World Wide Fund for Nature and Foundations of Success, make up the CCNet Global Board which is presided by a CCNet Global Chair. We also have a small global coordination team with five members, including the CCNet Chairperson and two coordinators (whose time is covered from the central CCNet budget, adding up to 70% of a full-time paid position). Members of the coordination team work for partner organizations and volunteer their time. This group is responsible for ensuring a timely completion of Network activities. Our global work is made possible by the considerable in-kind support provided by members, partner organizations and donors. We are pleased to present this summary of our accomplishments during the past year. New Zealand, Philippines, Republic of Congo, Russia, United Kingdom, and United States. We currently have 682 active coaches, representing over 200 institutions and helping projects in over 60 countries on all continents. Our Network serves a wide range of participants from all walks of life, including students, active professionals, and retired colleagues. Slightly over half of our coaches work with non-profit organizations, followed by 18% in independent consultancies and 14% in government agencies. Approximately 7% work with academic institutions, 3% are affiliated with community-based and indigenous organizations and networks, 1% represent foundations, and 0.5% work in land trusts. second invitation round in early 2019. Approximately every two years, our CCNet Rallies provide an opportunity for the Conservation Coaches Network community to connect, share innovations, sharpen our skills, and uplift our spirits. We held our seventh CCNet Rally, “Building Resilience and Working Together,” for 127 participants from 48 different institutions and 26 countries from April 30 to May 3, 2018, in the stunning Blue Mountains in New South Wales, Australia. Rally participation was significantly bolstered by the generous contributions of sponsors and supporters. We launched our first Crowdfunding campaign on Chuffed.org with Australian organisation 4Nature and raised AUD$7,472 through donations by people from 17 countries. These funds and additional donations enabled us to cover a large portion of event costs and directly assist over 60 participants with attendance costs. At CCNet we have a motto that is the heart of our community: learn it and pass it on. Generosity is what fuels our community, and the Rally provided a golden opportunity for all participants to engage and actively contribute to strengthen each other to do better conservation. Thanks to a hard-working, enthusiastic voluntary planning team and help from coaches around the world, we offered diverse activities, such as plenary events to expand our horizons and inspire us to continue adapting to the world’s needs; workshops to hone existing and new skills; working group sessions for sharing approaches, exploring specific problems, and developing guidance; bushwalks with aboriginal owners and local experts and unstructured time to foster networking. The feedback we received in evaluations both for sessions and the overall event was overwhelmingly positive. Learn more about our CCNet 2018 Rally and check out workshop materials here. We added updated content, event announcements, and reviewed and rated training materials to our CCNet website to enable colleagues from around the world to access free resources to help conservation and sustainable development projects and train colleagues in multiple languages. Through a simple e-mail exchange service we currently connect 680 subscribers from around the world who ask questions, share experiences, and communicate interesting opportunities about the application of the Open Standards and related conservation and sustainable development topics. We produced our biannual CCNet News to provide a unique forum where conservation practitioners tell stories about their work around the world in their own words. We invite you to look at past editions and sign up for the CCNet News here. We currently have 14 regional franchises and one thematic network that focuses on teaching adaptive management in collaboration with academic institutions. CCNet franchises are localized groups or network hubs, who link and support coaches within each region. In 2018, we strengthened leadership in North America and Southeast Asia. Most franchises conducted courses to train practitioners and students. Worked with a wide range of Open Standards community members to review and update the Open Standards. The Open Standards version 4.0 will be shared later in 2019. Launched our second global Open Standards “Adaptive Management Case Study Competition.” Read more about this process and the three winners from Chile, Colombia and Australia here. Worked with a Joint Guidance Review Committee to review and post materials on the Open Standards and CCNet websites. For more information, contact John Morrison (CCNet General Coordinator) and Cristina Lasch (CCNet Operations Coordinator). and investigate new funding models for a self-sustaining network.